This is Ken Audio System, Audio Setup. To be frank, according to Ken, it is only 50% done. Due to Ken's hectic working life and busy schedule, Ken only manages to just simply place the speakers on a corner of the room and listen to them as background music. Ken wanted to migrate to PC Audio but that remained as a plan for almost a year! Shame on him! Go to Ken's Audio System Video. Ken had been waiting for a pair of high efficiency speaker for Ken Audio System, Audio Setup, that is very tube friendly and does REAL BASS for quite some time. 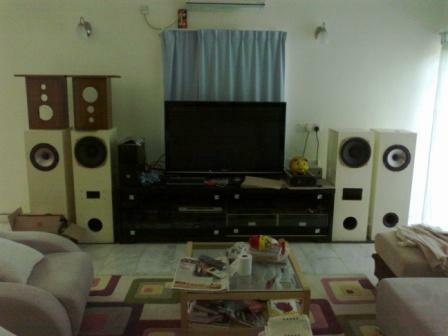 The closest he got is the Tannoy Monitor HPD 385 speakers with 91 dB/w/m that he still owns. He missed the chance to own a pair of Tannoy Monitor Gold a few years ago and he regretted until today. Until about 8 months ago, his dream was realized when Zu Audio came out with the Soul Superfly. 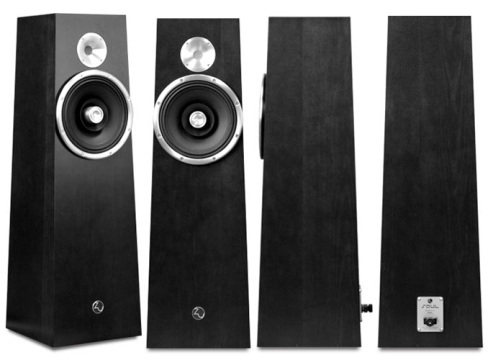 Soul Superfly is a high efficiency, high output floor standing speaker. He fell in love with it when he first saw the specifications: 30 – 20 kHz with dynamic range of 120 dB, 16 Ohm impedance, and 101 dB/w/m!!! This is one crazy ultra high efficiency speaker! Analyzing the specifications, the SPL vs frequency response is within +/- 5 dB across 35 Hz to 20 kHz with speaker system in-room. The impedance does not dip lower than 9 Ohm across the whole audio frequency spectrum. This is really very friendly to tube amplifiers that dislike big variations in impedances. For those who’re interested, check out the Soul Superfly specifications here. Go to Soul Superfly Specifications. The amplification used for Ken Audio System, Audio Setup is the DIY 5687 inter-stage coupled 6B4G direct heated single ended triode vacuum tube amplifier with 5U4G choke input vacuum tube rectification. 6B4G is actually a 2A3 equivalent tube. They’re not inter-changeable since the filament voltage and base are different. Also, all 6B4G are dual plates where as 2A3 has single and dual plate versions. 6B4G’s are not commonly used in commercial amplifiers and therefore the NOS (new old stock) vacuum tubes are still plenty and carry a reasonable price. Ken finds that the sound is quite close and he does not mind paying a much lesser premium for good sound. Goodies are used all over the 6B4G SET amplifier – Lundahl LL1660 inter-stage transformer, BlackGate capacitors for bypass and B+, 3 chokes in power supply, choke input tube rectification, integrated EMI/RFI filter, high quality solid aluminum chassis, silver plated binding posts, solid core wires, dual-regulated DC filament heating for 6B4G, constant current source for all the amplification stages, stepped attenuator with SMT Dale resistors, and etc! He shall share the design with you guys later. Stay tuned. The amplifier picture above is just the prototype using the famous Tamura F-475 output transformer. The Tamura F-475 is not his and he was just using my amplifier to test if it is working fine after he bought from Japan. The Tamura F-475 is for his friend's EL34 SE amplifier. His version uses parafeed configuration using a plate choke from Magnequest and Sowter Mumetal Parafeed Output Transformer – 8995. 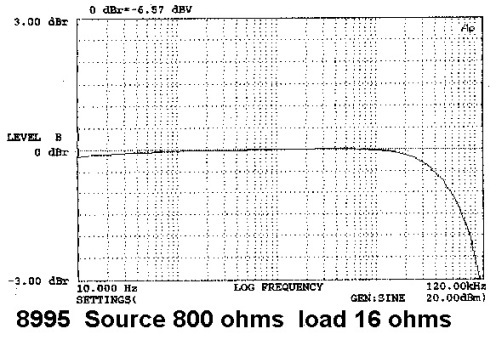 Above is the frequency response of the Sowter 8995 parafeed output transformer. The frequency response is flat from 10Hz to 100 kHz! The 8995 is a special mumetal output transformer that excels in the highs and micro-details. With parafeed topology, the bass is as equally good. With 6B4G or 2A3 flavor, the mids are sweet and warm. All these make it a very special amplifier. Right now the sound is still sub-optimal and he has to put more effort into the setup in order to get it optimized as current setup is only at 50% completion level. He had used the Sowter 8995 on an earlier project that is the 6C45 SPUD and it was later migrated from there since it matches the 2A3 or 6B4G amplifier better. The 6C45 SPUD was loved by him and his fellow audiophile mate D-man but the output power was a bit too low for real speakers as it is only 1.5 Watt. He has bought a pair of 5 kR output transformer for the 6C45 and will be messing with it later. 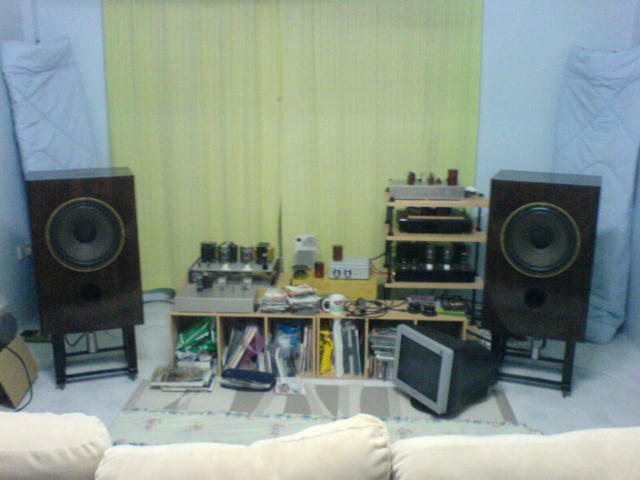 This is Ken Audio System, Audio Setup MK1. 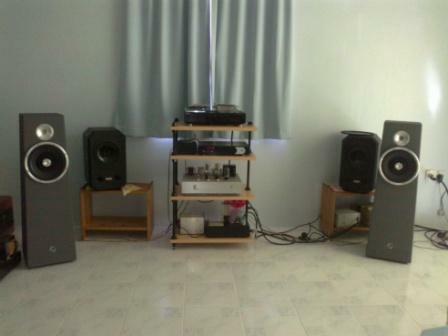 This is a picture taken before the listening room was converted to be part bedroom and part listening room. This placement actually sounded the best but due to unforeseen circumstances, it has to make way for new member in the house. 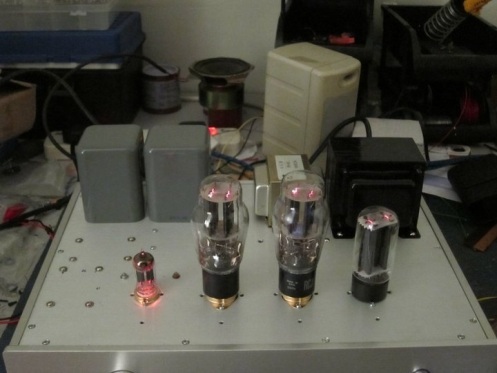 Amplifier: Carmen (modified & upgraded, Ken Signature version) x 2 (DIY 300B vacuum tube amplifier). Go to Carmen – DIY 300B Amplifier. 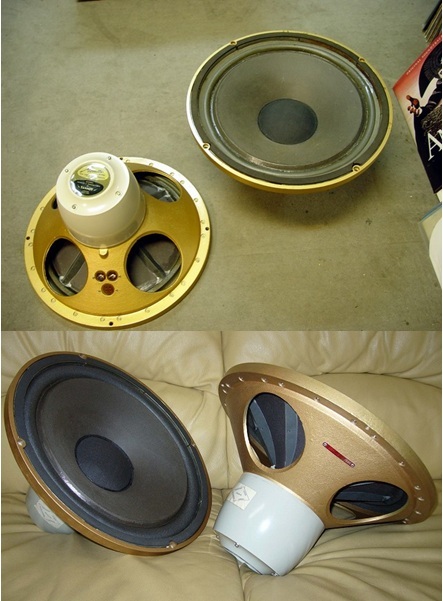 The Tannoy Monitor HPD 385 is a 15 inch co-axial speaker. 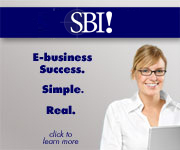 It is a highly sought after speaker nowadays. The sensitivity is 91 dB/w/m with power handling capacity of 85 Watts. Since he bought the drivers without the crossover, with the help of members from Tannoy Yahoogroup, he made an active crossover for it. Take a look at the build quality for these drive units! With the medium high efficiency, he could rock the room with only 8 Watts available from the 300B tube amplifier. For those interested to know more about the details of the 6SN7 / 12SN7 preamplifier, details of the DIY active crossover for Tannoy Monitor HPD 385 in Ken Audio System, Audio Setup MK1, stay tuned and come back later! This is Ken Audio System no.2 for home theater use. The Tannoy DCC 3149 12" driver is actually used in the Tannoy Edinburge speaker. 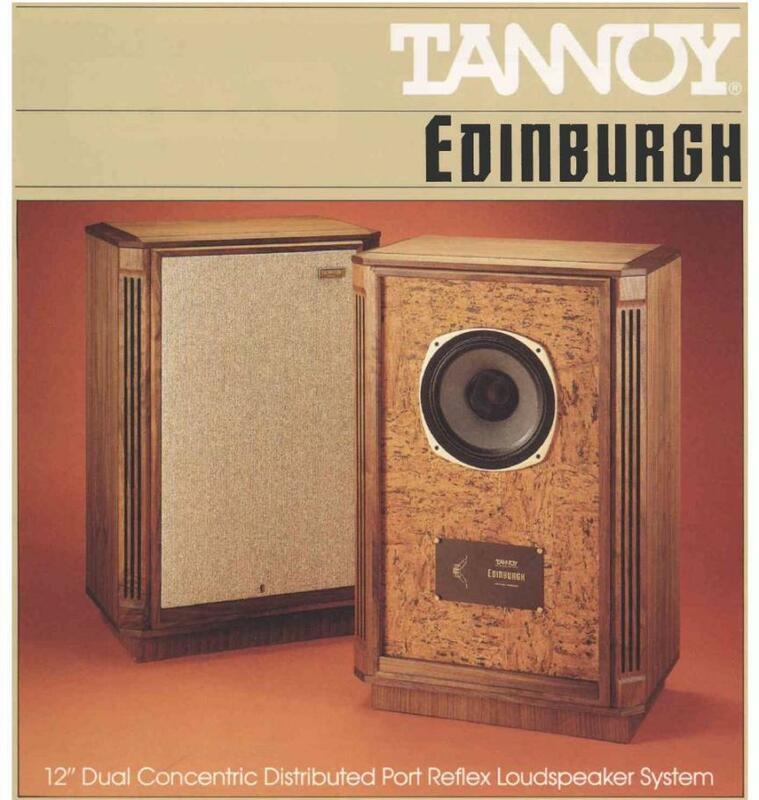 Click here for Tannoy Edinburgh brochure. 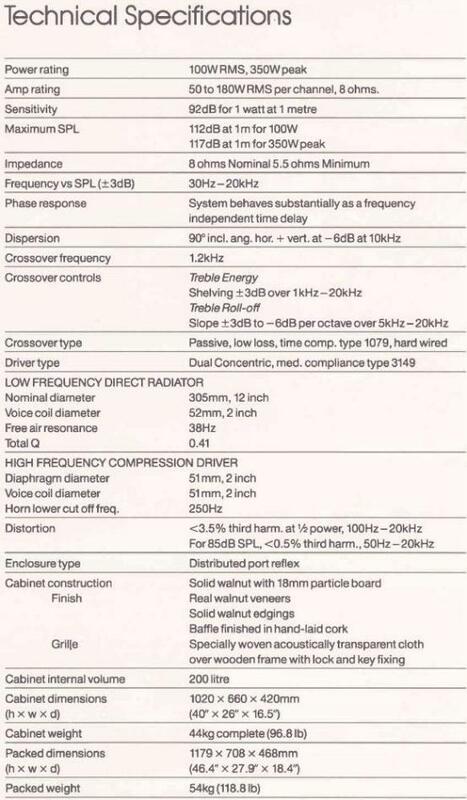 Click here for Tannoy Edinburgh Specifications. That’s it for today! I’ll continue with more details in the next session. Hope you enjoyed the virtual trip.